A surprise announcement was made by Statistics Canada that the long form of the Population Census is no longer obligatory. These are questions that have been asked for the last 7 Censuses and suddenly without notice or evidence to support the decision, these will not be part of the 2011 Census. This was not an issue discussed or on the table during Statistics Canada’s Census public consultations. Insiders tell me that Statistics Canada did not approve of this change and was ordered to do so by The Harper Government. This has very serious implications for those who monitor social indicators and use these data to inform policy on: immigration, ethnicity, visible minorities, education, labour, culture, religion, linguistics, income, women, transportation, commuting, unpaid work, housing and etc. in Canada. The long form will become a voluntary National Household Survey (NHS), conducted 4 weeks after the census disseminated to a much smaller sample size. This will affect any kind of longitudinal research as it will no be backward compatible with previous Censuses. I have contacted StatCan to find reports or studies that would have provided the evidence to support such a radical decision. I have also contacted the offices of the Information Commissioner, Privacy Commissioner. I think I will now contact my MP, opposition parties and so on. Here is Canada Gazetter Order in Council that approved the 2011 Population Census. It is not that informative as there is no context as to why the long form is not included. Below are media on the issue. I will capture PDFs of these articles. “Our role is to execute the decision that was made [by the government],” he said, adding that he is optimistic it can be a success. Globe and Mail: Tories scrap mandatory long-form census – StatsCan says quality of data will suffer. “What we can tell you is that the data we will release will be of quality, but we do acknowledge that we may not get the same level of detail as that of a census,” said Rosemary Bender, director-general of the agency’s census, social and demographic statistics branch. Montreal Gazette: Census restrictions hurt historians Feds cite privacy. Genealogists slams new rules protecting data. The idea of doing away with the long census questionnaire form, transferring the questions to the NHS and no longer releasing the information did not become public until Saturday, when it appeared in a government publication. The decision to change the census came from the federal government and not from the ministry or Statistics Canada, he said. The federal government is scrapping the mandatory long census form in favour of a voluntary survey — a move some critics blame on a Conservative campaign to slash analytical work done by Statistics Canada. Ottawa Citizen:Genealogists slam new restrictions on census information. A door to Canada’s past has slammed shut, leaving future Canadians with very little information about their own families and the country’s history, in a move the government says was prompted by privacy concerns. Statistics Canada has quietly made major changes to the country’s census in time for the upcoming round of national sampling in 2011. The long census questionnaire that provided information on a broad range on such topics as ethnicity, education, employment, income, housing and disability has been eliminated. Instead, those questions will be asked on a new, voluntary National Household Survey (NHS) and the results will never be released, in contrast with the treasure trove of census data that currently becomes public after 92 years. Le gouvernement fédéral a décidé d’éliminer le formulaire détaillé de recensement obligatoire au profit d’une enquête à participation volontaire, une décision que certains observateurs imputent à une campagne conservatrice menée afin que soit réduit le travail d’analyse fait par Statistique Canada. Officials from Statistics Canada say the 2011 census went through the usual consultation process, with citizens invited to provide feedback online. The idea of doing away with the long census questionnaire form and no longer releasing the information did not become public until Saturday. As many of you are aware, there was an earthquake in Canada today that was felt on both sides of the provincial border between Quebec and Ontario in the Outaouais region as well as on both sides of our national border with the US. Shortly after the earthquake occurred, I searched for up to the minute seismic data. I immediately went to Earthquake Canada, and sadly it was not working, and did not start working until well after the twittersphere fed many USGS links. See #earthquake. The Earthquake Canada data display is static, does not provide the user with much context but is aesthetically pleasing. The USGS data display was instantaneous, dynamic and was accompanied with a visual cue enabling the viewer to decipher the magnitude of the quake on a scale. The data are easy to read and the user can zoom in and out to see more precisely where the earthquake occurred. 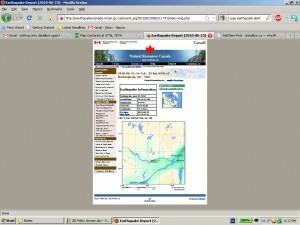 the extent of shaking and damage for earthquakes in Canada. The specific details you may provide will help us determine how your area may respond to future earthquakes. In the US the Did you Feel it? solicits the reporting of unknown events and provides a list of up to the minute data from which the user can assess whether or not their report is new. Both sites also provide educational information. 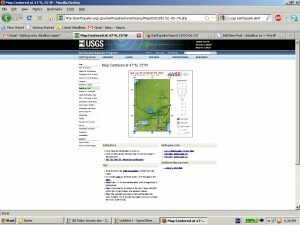 The USGS site also provides real time data feeds and KML formats as well as a Earthquake Notification Service. Both sites also provide access to a variety of seismic data. The Geological Survey of Canada has a fully searchable Earthquake Database containing data starting in 1985, albeit the data are made accessible with a rather restrictive end-user agreement. The USGS Catalog searches a number of databases that are global or region specific, provided by different agencies and have varying date ranges. Because data are accessed from numerous databases it was difficult to assess data licensing, however, generally in the US data are a public record and are in the public domain. Overall, the USGS fared better on timeliness, reliability, useability, interactivity, includes more data, and has at a glance the data can be used with less restrictions. I however, am partial to the cartography on the Canada GSC site. Access to public data is one of the most popular VOTE topics in the submissions on the Digital Economy Consultation site. Here are the VOTING submissions that ask for open data, open access and open government. 1. Open Access to Canada’s Public Sector Information and Data is looking for some votes. Take a few minutes to login and vote! If you can, provide a comment about how access to data has improved or will improve your work. The voting system has been restored! An official read the lists and contacted their colleagues which is great. But alas! There was no way to contact anyone on this consultation and not sure if they will extend the dates. I wish that offices would better coordinate their activities – for instance, CRTC just ran a consultation. Help could have been sought from them to set up a more reliable system! I contacted our expert at the Digital Economy Consulation who provided me with the response below: “We are aware that there have been recent difficulties on the website in regards to voting and/or providing comments. The problem has been rectified and we would encourage the participant to retry and/or resubmit. If you are still experiencing problems, please contact us soon as possible” I hope this is of help to you. If you have further questions please do not hesitate to contact us at the coordinates below. the voting system for the website has been restored by the external service supplier. Your emails to the community at large were forwarded to colleagues responsible for overseeing the site. Tomorrow, I will raise again other issues such as help contact info and proactive disclosure of the supplier. The voting system is broken. Please adivise these folks! Imagine no direct responsible telephone number or email! Please vote – Open Access to Canada’s Public Sector Information and Data. This is part of the Industry Canada Digital Economy Consultation. Please take some time to vote and distribute within your networks and institutions! It just takes a few seconds. We are at a tipping point on this issue in Canada and your few seconds of your time could open up our data resources. You will also see a complimentary Research Data and improved access to publicly-funded data submissions that could also use some votes while you are at it! Below is the text. If you have ideas that can be added for a formal submission, I would be really glad to hear from you! Create a data.gc.ca for Canada’s public sector information (PSI) and data in parallel with the excellent NRCan GeoConnections model (e.g. GeoGratis, GeoBase, Discovery Portal). These PSI & data should be shared at no cost with citizens, be in accessible and open formats, searchable with standard metadata, wrapped in public domain or unrestricted user licenses, delivered within an an open architecture infrastructure based on open standards, specifications and be interoperable. It should be governed with open government principles whereby data & PSI are shared first and arguments to restrict are made only for legitimate privacy and security reasons which should also be disclosed. It should have a permanent home and include both the right combination of multi-departmental (e.g. CIC, INAC, HRSDC, NRC, NRCan, etc.) inputs, trans-disciplinary human resources (e.g. Librarians, archivists, scientists) along with IT specialists & engineers. It should be built in consultation with Canadians to ensure it is designed with user needs and useability in mind. (This is how the GeoConnections program built the Canadian Geospatial Data Infrastructure). The Government of Canada produces administrative data for the purpose of program delivery (e.g. Canada Student Loan, location where new Canadians land, the number and location of homeless shelters, etc. ), and it produces data for the purpose of governing for example: the data collected by Statistics Canada (e.g. Census & Surveys, National Accounts); Environment Canada (e.g. air & water quality, location of brown sites); Canada Centre for Remote Sensing (e.g. satellite and radar imagery); Industry Canada (e.g. corporate registry); Canada Revenue Agency (e.g. Charities dbase); National Research Council (e.g. Scientific data); SSHRC (e.g., social science research data) and more. These data have already been paid for by Canadians via taxation, and the cost of selling these data back to citizens on a cost recovery basis is marginal or more expensive (e.g. Cost of government to government procurement, management of licences, royalties, government accounting and etc.) relative to the benefits & reduced overhead of delivering these data at no cost. Furthermore, Canadians often pay multiple times for the same data, since each level of government also purchases the same data, federal departments purchase these data from each other and there are examples where municipalities purchase the same data multiple times from Statistics Canada. This is not only a waste of taxpayer money it goes against the principle of create once and use many times and of avoiding the duplication of effort. Data & PSI are non rivalrous goods where sharing and open access to these does not impede other from doing so. Open access stimulates research and IT sectors who will have the resources they need for the creation of new data R&D products (e.g. Applications) and services (e.g., web mapping), evidence based decision making (e.g. Population health), and informing public policy on a number of key Canadian issues (e.g. Homelessness, housing, education). In addition, evidence from Canadian City Open Data Initiatives (e.g., Vancouver, Edmonton, Toronto, and Ottawa) have demonstrated that the cost and time to find and access data & PSI within government have been greatly reduced since finding these are easier and negotiating access becomes a non issue, which in turn brings savings to citizens and greater efficiencies within these institutions. Finally, participatory and deliberative democracies include the active engagement and inputs from citizens, civil society organizations, the private sector, and NGOs along with their government. Making these data available increases the collective knowledge base of Canadians and stimulates public engagement, improves efficiencies, and fuels innovation. These are already our (citizen’s) data & PSI, why not share share them with us and enable citizens and the government to work together to stimulate Canada’s economy, create innovative industries and formulate evidence based public policy. I thought I would share the presentation I gave yesterday at the Museum of Science and Technology at the Canadian Association of Science Writers conference. Emily Chung a CBC science writer put together a great session. I am starting to position the ideas of openness beyond their operationalizations and within the realm of culture and the political economy. It is a start. Below the slide show I include the text I used, image sources and references. View more presentations from Tracey P. Lauriault. Open Access (OA): Is primarily about the sharing of scientific and other scholarly publications. The data that inform the content of the articles are sometimes shared. Some funding agencies mandate that their research recipients publish their works in OA journals and make their data accessible. The objective for funders is a broader dissemination of results and an increase in the uptake of the outcomes of their research. International Polar Year researchers had to share their data and The Canadian Institute for Health Research (CIHR) mandates OA. Data Access: is primarily about the sharing of scientific and geomatics data. It is about building the necessary infrastructures, both soft and hard, to facilitate the storage, management, discovery and rendering of data. Often infrastructures are created within open architectures, based on open specifications and standards with a focus on interoperability. The Geoconnections program has built the Canada’s Geospatial Data Infrastructure this way. The CGDI also includes a Discovery Portal using ISO metadata standards. The program has also included the development of interoperable Unrestricted Data User Licenses. Open Government: is about making government information and data more available to Citizens. It is normally driven by issues of government transparency, disclosure and the uptake and use of social media in Government. The Interim Information Commissioner of Canada (2) is a supporter of open government. We may see as an outcome more centralized access to public sector administrative data and science data. The most prominent examples of are data.gov in the US and the UK Guardian Free our Data campaign. Open Data: is a nascent movement primarily led by young application developers and young public servants in IT departments and their youngish CIOs. The discussions are within those found in open government and it is citizen focused. The cities that have embraced open data with a degree of media success in Canada are Nanaimo, Vancouver, Edmonton, Toronto and Ottawa. The advocates organize to get data to develop apps mostly for iPhones & other mobile devices but they are not scientists, researchers or work in NGOs and therefore they are not always the community of big data users and producers. Open Government and Open Data initiatives overlap. OA is a lesser topic of discussion in these groups while we are seeing more involvement of the data access communities of practice. Culturally why are access to public data important? This Earthrise image, that data set, changed how we see ourselves, how we imagine ourselves. The late Joseph Campbell in “the Power of the Myth” in conversation with Bill Moyers in 1988 said it best as he reflected about the Blue Marble image. “You do not see divisions or nations. This might be the symbol of new mythology to come. That is the country we are going to celebrate and those are the people we are one with”. 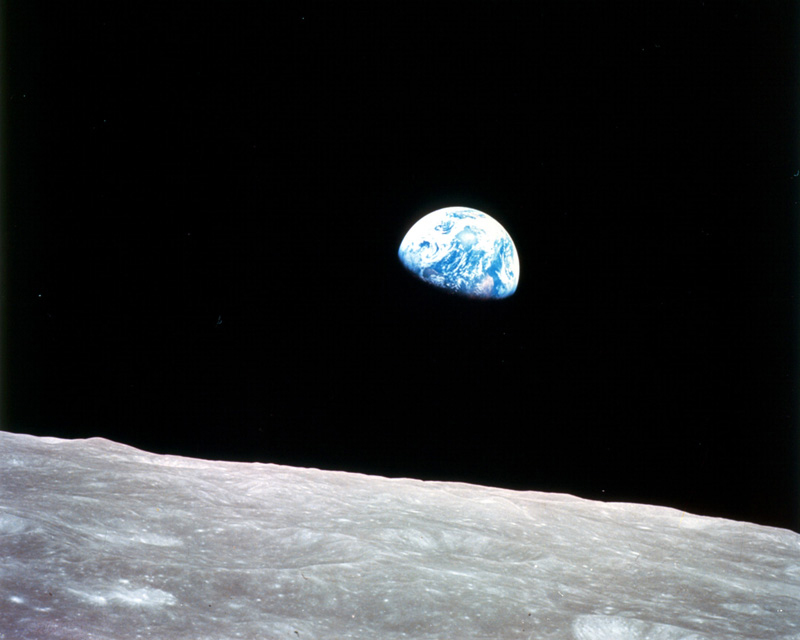 “This photo of Earthrise over the lunar horizon was taken by the Apollo 8 crew in December 1968, showing Earth for the first time as it appears from deep space”. Slide 3 – 1st Data Access Campaign? The Earthrise and the Blue Marble data/images however, did not come to use in a straight forward way. The dissemination of these images was part of a data access campaign led by Stewart Brand in 1966. He made the button, sold it for 25 cents on the streets outside the Berkley Campus wearing a big white suit, boots and using a yellow sandwich board. He got kicked off campus. He sent the button to high ranking officials in the US, UN and the Soviet Union, to our guy Marshal McLuhan and to Buckminster Fuller. In the 1970 we have earth flags, ‘we are all in this together’ becomes the norm, and the phrase ‘think globally act locally becomes’ a mantra. As Brand said “those riveting Earth photos reframed everything”. Back to the part of the world where astronomy began, today we have Aljazeera broadcasting images of new planets outside the earth’s solar system. Screen capture of Aljazeera.net article of First Images taken of ‘new’ planets. Viewed November 17, 2008. Data are more than facts, or the unique arrangement of facts in databases. Data are also culture & heritage artifacts, they are part of are our collective record & they fuel our imagination. Antarctica – The Continent of Science. The Antarctic Treaty System‘s primary purpose is to ensure, for all of us, that the continent will be used for peaceful purposes. Scientific research is promoted and the exchange of scientific data are mandated in a context where multiple territorial claims are abeyed. The system allows for the effective management of Antarctic geopolitics and environmental stewardship. There is transdisciplinary collaboration between and among Antarctic scientists who are integrating their scientific data into a comprehensive infrastructure. The data and the infrastructure are pillars of the Treaty System. Via: Pulsifer, Peter L., Taylor, D. R. F. 2007, Spatial Data Infrastructure: Implications for Sovereignty in the Canadian Arctic, appears in the Canadian Polar Commission newsletter, Meridian, spring-summer, April 25, pp. 1-5. Slide 8 – Spatial Data Infrastructures & Sovereignty? What do Colonial powers first do? They stake claims and they count people. In other words they map and conduct censuses. That is the politics of data gathering activities are. Today, the ice is melting in the north, there are territorial disputes and NRCan is undertaking one of the largest mapping undertakings in decades. Our current government is taking a ‘hard power’ approach in terms of territorial claims in the north. But what of an Arctic Treaty approach? Russia, Finland, Sweden and Norway are collaborating on a Joint Arctic Infrastructure (GIT Barents Project). Canada could participate in the building of an Arctic Geospatial Data Infrastructure which “could contribute to successful stewardship by helping to establish constructive solutions for sovereignty issues and for sound management of resources and the environment” (Pulsifer et al). This would include working with the people currently living in the north – people who benefit from OA and data access initiatives. This infrastructure could contain the evidence required for informed and collaborative multinational informed decision making. $427 Million in Canadian public dollars were invested in a private company to the build Radarsat 2. MDA Dettwiller shareholders in BC then decided to sell this Canadian Public asset to a US arms manufacturer. The deal included access to data on Canada’s north for the Canadian government. The sticky wicket in the deal was the Patriot Act. At any time the US could turn off the information pipeline to the worlds most powerful sensor. The sensor that can capture images of the earth through cloud cover, and can monitor ice. The deal was quashed. It was not an outcry from Remote Sensing specialists or scientists, the story got framed as a sovereignty issue. Suddenly the data mattered and citizens cared about the sale of their publicly funded technology. The Canadian Government has rights to data from Radarsat 2, but it cannot freely disseminate these to Canadians as the procurement deal was for their exclusive use only. We the citizens who paid for that technology, have to pay for those data and acquire these from MDA Detwiller. We need to negotiate better data & technology deals with our tax dollars. Slide 11 – Data Good and Evil? The American Association for the Advancement of Science (AAAS) is a not for profit organizations that collaborates with humanitarian organizations such as Human Rights Watch to purchase satellite imagery from satellite image vendors. They then pool their analytical resources toward understanding human rights issues in some of the world’s hotspots using those images. They provide excellent reports. And on the topic of satellite image control, shutter control and media blackouts. The US purchased, 3 month period, exclusive access of Space Imaging satellite images over Afghanistan and any images derived from IKONOS 2 that passed over the region. It effectively kept the news media out in the dark and left the public “without and independent channels for assessing the conduct of war”. Relief agencies were also unable to be informed on what to expect on the ground. The sensors that capture data are feats of engineering and science. And like all technologies, we shape them and they in turn shape us. Satellites are loaded with geo-techno-social-politics. New Copyright Bill Coming today! Watch Michael Geist‘s and Digital Copyright Canada Blogs!